Crush is a modern brand of beautifully handmade womens accessories. These are designed and made for every woman, to compliment and update her existing wardrobe, making the most of what she already owns and who she already is. The range includes scarves, belts, ties and skinnys with the focus on style, quality and craftsmanship. Giving you a beautifully made accessory that you will love wearing as it becomes a staple of your wardrobe both complimenting and extending the life of your outfits, rather than replacing them. Crush is designed by Nicola Rodgers, a former pattern cutter for high end fashion brands. It eveloved from her childrens wear label, Little Troll which in its 2nd season introduced the concept of wearing a collar accessory to extend and expand the look and life of kids fashion. The collection was taken by Selfridges Department Store in London and the brand became the iconic stores first ever kidswear Pop up Shop. The accessories gained a lot of interest, esspecialy the adult sizes, and so the decision was made to concentrate on those only in order to produce ethically and affordably and still produce high quality fashion. Now everything is lovingly designed and hand made here in the UK. Carefully packed, gift boxed and sent on to you. A little affordable luxury everyday. Crush accessories are exclusivley available to buy on-line through this website and its small etsy shop. THE SKINNY: A slim neck ‘tie’ designed to be worn with everything because it looks great with everything! The skinny is very versatile and fashion focused. It is super slim, unlined and hand made. New fabric ranges are added to the original one seasonally in limited editions. TRADITIONAL TIES: Designed to be worn with shirts for a smart look or worn with your favourite T shirt for a relaxed funky look. These are cut and hand made in the tradional way, with a soft canvas lining. BELTS: There are currently 3 styles. The signature Cloud belt comes in a variety of colours and will complete whatever your wearing. The embroidered belts and D ring belts are a must have looking just as good on the guys as the girls, so you’ll end up having to share it with your boyfriend. New belt styles are added seasonally though so dont worry! COLLARS: In 3 styles, designed to change or define the neckline of any top or dress. So little but so clever. Hi, my Name is Nicola and I’m the designer of Crush. I trained and worked in London for a number of years as a designer and then pattern cutter for high end brands. I started designing and making accessories back in 2012 while I was a childrenswear designer. The idea was to get more out the clothes as kids grow so fast and kids fashion has a really quick turn over! Eventually it evolved and developed into the womens range of accessories which now includes belts, skinnys, ties and most recently scarves. The ethos is to offer women accessories that enhance the clothes we already have, transforming them into something even more fantastic. Without breaking the bank they are there to make you feel and look good. We all lead busy lives and wanting to look and feel great should not have to take forever or break your spirit! You won’t have to squeeze your self into these and there is no chance of growing out of them. These accessories are for everyone regardless of shape, age, skin tone or hair colour. In fact there are so many colours and styles to choose from you’d be hard pushed to not find something that suits you! What I like most about the accessories is how versatile they are. The Skinny is the best seller because its so versatile, affordable and comes in so many great fabrics. It is a take on the traditional mans tie and was developed from the tie range. I wanted to offer something more relaxed and fashion forward, but still in a neck tie. Still defining the neck. So the traditional tie was slimmed down to the max, softened by making it unlined, and finished with angled ends to complete a really sharp and yet softly casual look. This new feminine shape was then put into gorgeous prints and plain colours and named the Skinny. Its simply a relaxed, feminine, version of a traditional tie that you can wear any day or night. Its not as relaxed as a scarf or as formal as a tie, it sits comfortably in between and I love it. It’s what makes it the best seller for Crush. A great accessory to have when you want to add a little colour or pattern to your day, an accent if you like. There is also no right or wrong way to wear it, no rules, thank goodness! Just tie as a tie, or simply loop it once, or wrapp around and around super short like a neckerchief, or layer with a necklace. They even look great on a bag! Ive been told customers how many compliments they get when they wear one, which is just the nicest thing to hear. You feel and look great however you style them I think, T shirts and jeans at the weekend, individualising your work wear, jazzing up a look for a night out. However, wherever, they are an instant refresher and a really easy day to night switch. The ties are a little bit of hand made luxury with style and comfort meshed together to create a beautifull accessory that will last you a lifetime. The guys should not get all the ties so these are just for us ladies! The collars I designed to transform the neckline of anything instantly. They come in 3 styles and lots of gorgeous fabrics. The buckle belts bring your outfit to life. They are really tactile and super comfortable to wear too. I hate belts that dig in so these had to feel as though they werent even there! There is the glitter belt which looks great added to black jeans and ankle boots for a gig night or in pastel shades for a more subtle look. Wear them with soft knitts, dresses, jeans, they are really versatile, funky and feminine. The Elastic belts are a wardrobe must have. Sharp looking but soft wearing, real understated cool. Plus they keep your trousers where they should be! All the accessories are designed to enhance or change your outfit styishly and quickly. They are made to enhance who we are and make our life easier, more beautiful and a littel bit fun. They are a really easy way to re vamp your look and add a little extra style when feel like it. 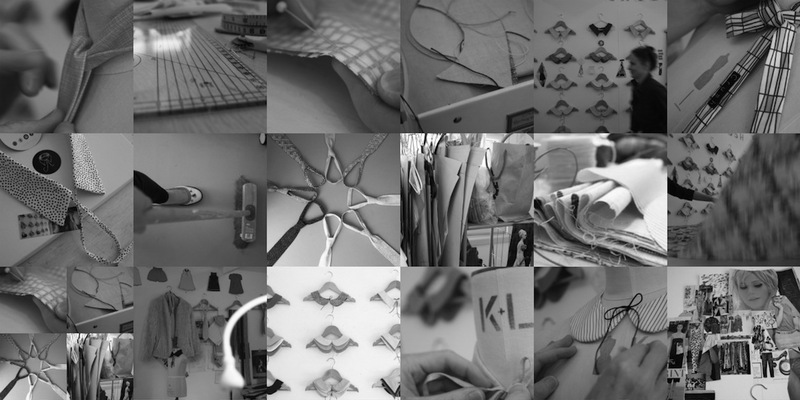 All the accessories are cut, pressed and finished by hand in a studio in Hitchin. Specialising in just accessories allows the time to work at a more bespoke level creating a little affordable luxury for everyday. I also offer custom made too for when someone has something very specific in mind. On a more serious note I hoped to produce something that would make the most of what we aleady are and already have, not use an enormous amount of fabric if I could help it and create work for skilled women in an environment that is really supportive. A studio environment allows that and I hope the business will grow and grow to create work for more skilled people. I really hope you like the whole accessories range. They are made for women everywhere and I look forward to bringing out more and more, making the world a happier place one accessory at a time !